One of the persons I want to meet in person one day on this side of heaven, is my dear friend Trisha Poff who blogs at A Multitude of Mercies. I am grateful for her life and for the providence of God who has brought us together in such a special way. We don't want to leave our children out of the kitchen, do we? It's important as mothers to be nourishing our children's souls with sound doctrine as diligently as we nourish their bodies with good food. Our husbands are the spiritual leaders of our homes, and yet, we have the wonderful privilege to speak His truths to our children all day long. But what does this look like, especially as we mother our Littles? This season of parenting is known for it's unpredictability as we try to keep up with the laundry and dirty dishes, preserve our sense of humor, and not fall asleep while having a conversation with our husbands or while sitting in church. While I'm sharing some practical ways to teach your children doctrine throughout the day, please note it comes with a HUGE caveat. The best way you can teach your children His truths is to live them out yourself right before their very eyes. Words that come from the mouth of a heart that's not surrendered to the Word of God will fashion hypocrites and Pharisees. God help us to make sure the walk lines up with the talk. Let us not, by God's grace, be stumbling blocks to these precious souls God has entrusted to our care. That said, here are just a few things I've learned in the 16 years I've been a mommy. 2) Be enthusiastic. Ask your children to tell you what they think you're passionate about. Is it cooking? Reading? Sewing? Should not our passion for His truths be just as strong? How is your voice when you're reading the Bible? Do you share your tears with them when you're overwhelmed by God's goodness? Do you communicate that being in the Word is just another thing to do before getting to the “good stuff”? 3) Teach the catechism. What a wonderful tool this is for planting sound doctrine in the hearts and minds of our children. The word catechism simply means “question and answer.” Who made you? God made me. Our family starts with the Children's catechism, and then moves to the Heidelberg around age 8. 5) Remember the power of music. Songs stay with us. How many of us have songs that we learned years ago still floating around in our memories? Learn hymns. What a rich treasury most of them are of truths founded on God's Word. Listen to music by artists like Judy Rogers or Dana Dirkson as well as the Hide 'em In Your Heart CDs by Steve Green. All of these are full of sound doctrine. 6) Share how sound doctrine has affected your life. Our children love to hear us talk about ourselves, don't they? When I tell my children I used to read Benny Hinn's books or share other follies, I let them know the price of ignorance. False doctrine is an invitation to sin, and our own errors should make us that much more passionate about teaching our children well. 7) Make Scripture your standard. From the beginning, the question should be, “What does God's Word say.” Measure your life by His truths and your children will learn to do the same. 10) Redeem the moments for His glory. When you see the butterfly, talk about how God made everything and how He makes us new creations in Christ. When you're changing a diaper, recite the first questions of the catechism, sing a hymn, or quote Scripture. (Yes, I do this!) When you're brushing hair, remind your child that the very hairs on our heads are numbered by God. 12) Remember God's grace and the work of the Holy Spirit. If you haven't been teaching your children sound doctrine, don't despair! Start today. And if you have been faithfully imparting God's truth to your children, guard against pride, remembering that it is all by His grace, and that we cannot do the work of the Holy Spirit in our children. 13) Remember the basics. Have you taught your children the names of the books of the Bible? The Ten Commandments? Psalm 23? The Nicene Creed? Sometimes it's easy to focus on big accomplishments while rearing Biblically-illiterate children. 14) Don't forget the Church. Model to your children the importance of being part of and accountable to a local church body. Teach them what a gift it is to be under sound teaching each week and part of a community of believers. I'm delighted to tell you that Judy Rogers has graciously offered to give away one of her CDs, Why Can't I See God? And Doorposts generously offered to give away their “The Put On” Chart. 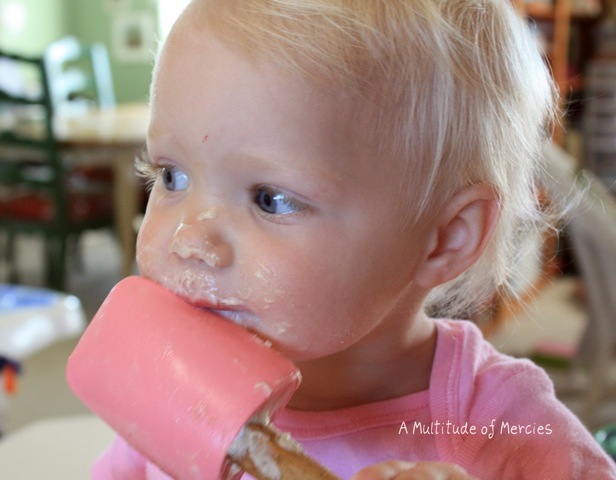 Doorposts is a company I highly recommend for Biblically based parenting products! Be sure to check out their websites! Just leave a comment on this post, and we'll draw a winner to receive these two great products directly from Judy and from Doorposts. The winner will be announced Saturday, April 23. Be sure to come and see if you won!